Thanksgiving Weekend is one of the most relaxing times for players, with those celebrating throughout a four-day weekend. 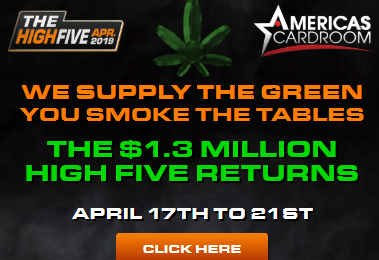 On Americas Cardroom, players will have plenty of time for some leisure activity which is why they’re running the All You Can Eat Bonus promotion (Nov. 24th-27th). So when you’re not eating, catching up with family, shopping or watching football why not check out the games on ACR and take advantage of these Thanksgiving Specials. This is a four-day promotion (Thursday thru Sunday) will allow all players to earn up to a $400 Poker Bonus and get a 20% buy-in discount on select tourneys on Black Friday. • $400 in Free Poker Bonus. For every 100 hands a player is dealt into, they’ll receive $10 in bonus. Players can earn up to $100 per day in bonus and $400 total. • Black Friday type Tournament Buy-in Discounts. Who needs the mall? Players will earn 20% discounts on buy-ins for select poker tournaments. All new players who deposit will get a 100% Deposit Bonus up to $1000, 20 days of Free Jackpot Poker and Depositor Free Roll Entries for the entire month.